This lovely Cley Summerhouse was completed in the dark, hence the rather grainy photograph! This is still good for example purposes though, so we wanted to share it with our readership. The customer’s home is in Syston, Leicestershire, and the Cley has been installed in the back corner or their garden so they will have a good view of the rest of their garden as they enjoy their new summerhouse with their friends and family. Top grade Canadian cedar shingle tiles have been used on the hipped roof, which help to bring a natural and traditional look to the building, and these have been paired with Georgian windows and Valtti Paint in Sage for the building itself. There are four sets of double windows around the building in total, with the windows on the gable ends able to open to allow plenty of fresh air into the building on warm summer days. 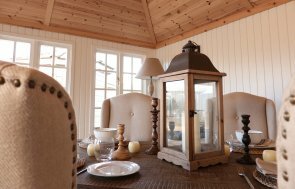 Inside the Summerhouse, the customer opted for natural matchboard lining on the walls, and insulation in the walls and ceiling, so it will be suitable to use all year round, if they wish to use it as such. 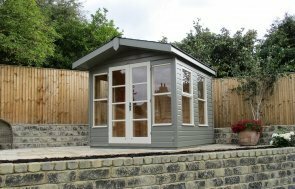 This is a charming, traditional Summerhouse, and if you would like one for your garden, or if you have any queries about our timber at all, please Contact Us or call us on 01760 444229 and we’ll be able to help in any way we can.